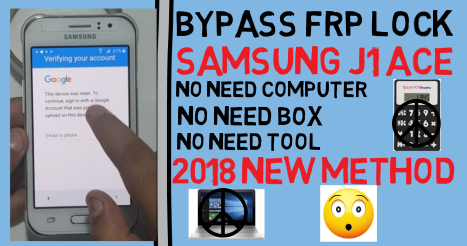 Bypass FRP Lock on Samsung J1 Ace Without PC or Box. Bypass FRP Lock on Samsung J1 Ace Required File. 2# Download Google Account Manager V5.0Apk. Samsung J1 Ace Bypass FRP Lock Method. 2# Tab 3 time home buttion. 5# 3 time click home disable talkback. 6# Go to Private poblic. 9# Download Google account and quickshortcut maker apk. 12# Go to Google account manager. 13# Logine new gmail id. 15# Now open your on normal mode. 16# Go to account setting and remove logine gmail id. 17# Now your phone frp lock remove complite.